The needles have been pulled, the wounds dressed, the hospital gown thrown in the corner. It is time to go home. Step 1: Secure admission release. This first step involves copious amount of begging; it helps to pinch the inside of your thigh to produce some watery eyes. Waver your voice appropriately and repeat the following: "I haven't slept in days. Please, please let me go home." It helps to refrain from showering at this point; the stench alone will point to your release. No one likes a smelly Kelly. Step 3: Take the last of your drugs from the nurse, knowing that you won't have access to Dr. K (Klonolopin) until you get home. Pass out for the car ride home. Note: this portion of the recovery will be very hazy and involves sending incoherent text messages. A choice one, from myself to my friend: "Call bike suit." I'm not sure what that means, and judging from his lack of response, I don't think he did either. Step 4: Set up shop in your childhood bedroom. Step 6: Flood your minions with demands. "Apple sauce! Snapple! Sugar Free Twizzlers!" The sky is the limit, kid. Take full advantage. This is a diabetic's dream. Forget the protein, go with sugar free everything. Step 7: Sleep. Dr. K has arrived in its bottled glory. Take a copious amount. Even though you will wake up every twenty minutes and continue to send questionable text messages, revel in the pain-free existence that K-dawg has brought into your life. Step 8: Awake at sunrise and debate briefly taking Shea for a walk. One step out of bed proves your strength is not up for it. Crawl back into bed and watch and weep through the series finale of Family Ties. Step 9: Stare in the mirror at the constellation of bruises from the Heparin shots injected into your stomach. Debate the best way to take a picture of this to send. Quickly realize that no lens in the world has the ability to siphon away this belly fat. Step 10: Engage in brutal fight with Mother, who insists your smell is overwhelming the house. Hold your ground. You have earned the right to stink, and dammit, you will. Step 11: Submit to shower. Reread the 100+ tweets you sent while under the influence. Question sanity and ability to function in society. Crawl back onto the couch and once again, yield to the power of mindless sitcoms on Comedy Central. Repeat the following mantra: "Sitcom, sitcom, slow death." I think we're getting there, guys. Yay for showering! I'm so proud. I smell so much better. It's unreal. i didn't even faint. This is so wonderful. Feeling you. You are hilarious. And rocking that mask. The mask is awesome! Showering is totally overrated, and completely not necessary when you're in Jersey, at least that is what I told myself today at noon while I was in my pajamas still and drinking a beer. Jersey will do that to ya. I'm with Karyn. The mask is totally you and showering, meah, overrated. Then again, sometimes after something that traumatic showering can feel like washing away the weight of it all. I heart you and admire your strength and humor in the face of all this crap. 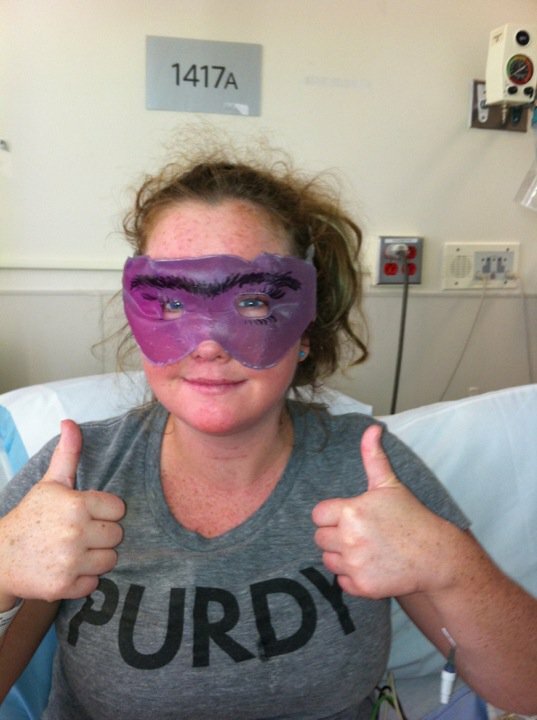 Go superhero KellY!